Imagine a fowl banquet of excess gluttony, an embarrassment of victual riches; picture manna from the ocean, tasty and nutritious provender from a bounteous source; visualize a vast pelagic smorgasbord of plankton, kelp, fish, and seaweed, served up for hundreds of feasting sea birds and ocean-venturing mammals. 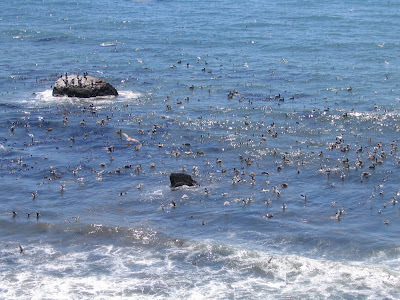 Truly, what I am witnessing today is a feeding frenzy in the rich waters of the Pacific Ocean off the rugged coast of Pt. Reyes National Seashore. 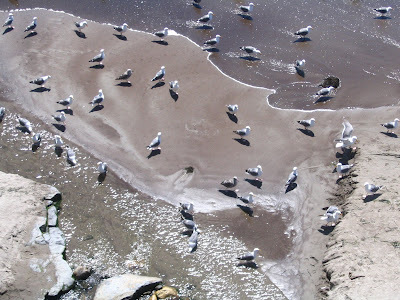 They have gathered out of nowhere, everyone in attendance, jostling for position, loudly squawking, busily and single-mindedly feasting -- pelicans, gulls, terns, seals, cormorants, loons, albatrosses. 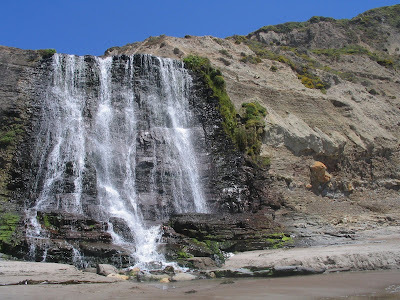 The epic pig-out from atop Alamere Falls, through binoculars, provides spectacular telescoped views of birds diving and chewing and chomping and swallowing, and wondrous zoom-in portraits of seals submerging and coming up with fish clenched in dog-like mouths. Gradually, the drifting ocean currents migrate the bacchanalia northward, as it disperses ever so slightly; still, for a solid hour, the free-for-all continues. Finally, it’s time to pack it up to hike t he four miles back before dusk sets in. Welcome to Pt. Reyes National Seashore, where surprise after surprise after surprise will brighten your day. Being a local attraction, surprise! -- it’s as exotic as the Galapagos Islands. 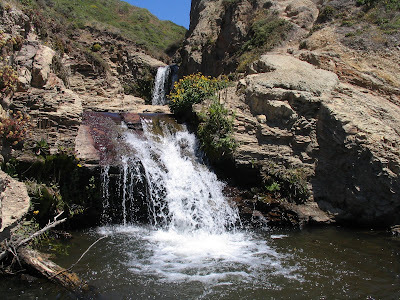 On any given visit to this special place in western Marin County, a mere hour north of San Francisco, surprise! -- you never know who you’re going to encounter (animal wise) or surprise! -- what you’re going experience (human fun wise). On any given day in the 100 square mile Mediterranean Ecosystem, surprise! 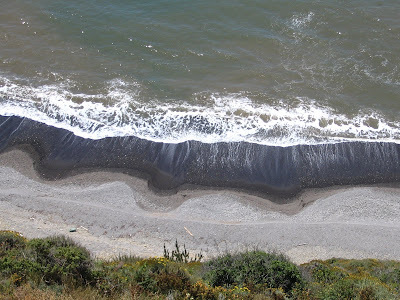 -- your chances are good to excellent to see many members of Pinnipedia : lardy California and Steller sea lions; stand-offish Northern elephant seals lounging on broad beaches; and orgiastic harbor seals congregating en masse at a rocky point. On clear days, if lucky, surprise! 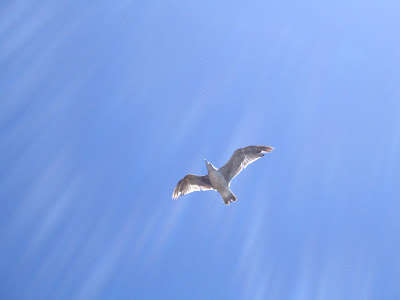 -- you might see any number of 20 species of whales and porpoises from shore. Hiking an endless network of wilderness trails, surprise! -- you can easily spot a herd of tule elk foraging in lush meadows; or come across semi-endangered black-tail deer or the unwanted competitors: exotic, i.e., non-native, deer (fallow deer and axis deer, numbering over 1100, are a major problem, a destructive presence in the delicate ecosystem, promptin g the NPS to develop a plan to have them completely removed by 2021.). On any given day on any given trail, surprise! 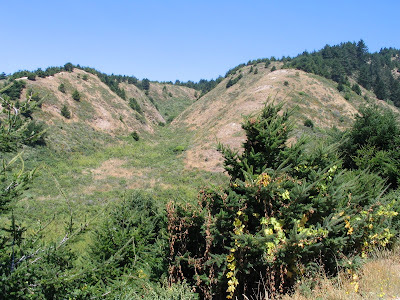 -- you’re apt to see black-tailed hare, brush rabbit, mountain squirrel, pocket gopher and chipmunk, birds galore, rattlesnake, coyote, fox, weasel, bobcat, and, rarely, if ever, but testament to the wildness of the place, mountain lion and black bear. Okay, so you’ve got a measly day on your hands: what to do, where to go? Choices are innumerable and alluring, and you can’t do or see it all. Lucky for you, you don’t even have to choose wisely, for no matter where you decide to have your fun -- The Lighthouse, Drakes Bay, Limant our Beach, Tomales Point, McClure’s Beach, Pt. Reyes Beaches North and South, Abbot’s Lagoon, Wildcat Beach, Alamere Falls -- Pt. Reyes National Seashore is guaranteed to provide scenic natural wonders, challenging hiking trails, rare and precious ecosystems, vast oceanic vistas, and a never-ending sense of awe and wonder at the unique beauty encompassing these wild lands preserved on these near fringes of the madding crowd, the encroaching megalopolis. We begin our 8 mile out ‘n back hike at the southernmost entrance to the park, near the world-famous Pt. Reyes Bird Observatory, a few m iles outside the legendary hippie town of Bolinas, at the ever-popular Palomarin Trailhead. Coastal Trail starts off easy, serving up tremendous views of a celadon-colored Pacific ocean, before winding into back hills for a more intimate, lush, Hawaii-like ambience, and then it emerges again to windswept vistas on the rugged cliffy trail. Just a great hiking trail in a wonderful wilderness. We pass through magnificent forests of Douglas Fir and eucalyptus, interspersed with occasional oak, bay, madrone, and the odd redwood. The winding trail is lined with coffee berry, poison oak, coyote brush, lupines, and untold displays of colorful wildflowers in season. Located as it is just off the San Andreas Fault, the geology can’t help but to fascinate -- how can it be that these rocks are of the same source as Tehachapi Mountain rocks 300 miles south? What earthly forces caused them to end up here? 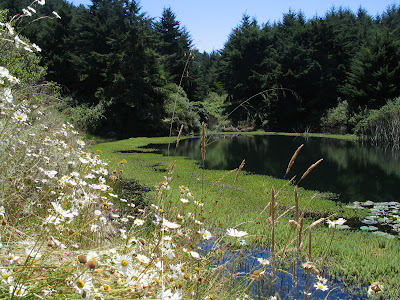 After a couple of miles, in the forests high above the ocean, we come to several small ponds just before the popular swimming hole called Bass Lake. I’m drawn to a small trail diverting down to a peaceful, zen tableau of blossoming lotus flowers on a small pond’s velvety surface. I snap a few photos and stand in admiration at Mother Nature around me, silently joyous in my heart over this unexpected, sweet-scented, tropical sight. 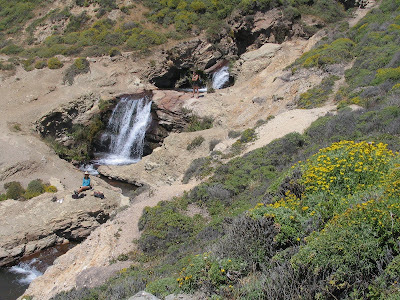 At mile 3.5, the trail junctures -- Coast T rail continues on another couple of miles to Wildcat Beach and some amazing back country, pristine camping areas; and a half-mile spur trail leads down a rutted, narrow trail to Alamere Falls. 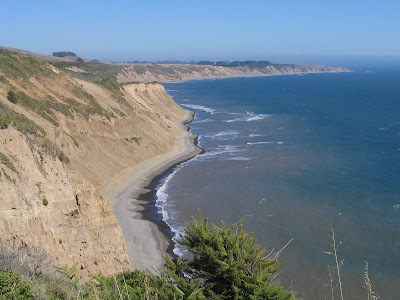 The final approach is a steep 500 foot descent to a fabulous look-out point on a rocky knoll; off to one side, a sweeping Pacific panorama; off to the other side, a small, seemingly insignificant stream cuts a small, seemingly unimpressive canyon through dry, rugged coastal hills. 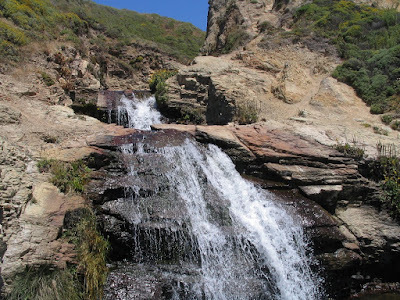 Nearing the high cliffs of the beach, the canyon widens to allow for the formation of waterfalls and beautiful pools cutting bedrock to the thirty foot dead-drop terminus of cascading water at the beach - Alamere Falls. It’s an utterly magical place to be late in the season, on a hot day, with plenty of water still churning through hard rock channels. I’m reminded of back ‘o beyond canyon scenery in the desert Southwest. 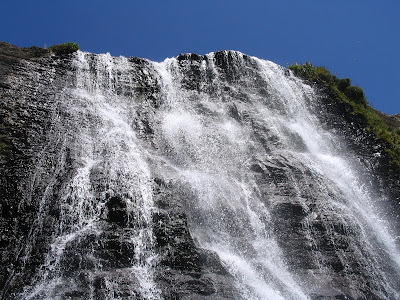 Utterly magical, exotic and remote, despite the gathering number of hearty hikers making their way to the popular spot. Time passes easily at Alamere Falls on the beach. 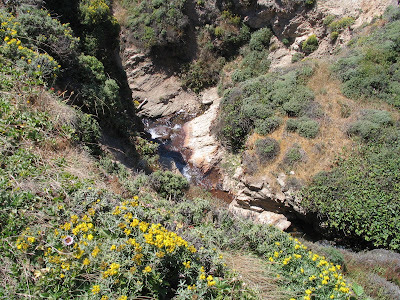 Lunch and meditative reverie beside the canyon stream; bird watching and the feeding frenzy episode; climbing around, exploring, and walking the endless beach, mesmerized by rhythmic waves pounding the sandy brown shoreline, beachcombing for polished pebbles, sculpted driftwood and starfish. There’s no place like Pt. Reyes National Seashore. Lucky for me, I can return on any given day for another adventure, another surprise.